I just wanted to acknowledge my friend William, who comes to my blog and leaves witty comments. I really appreciate that he reads and responds to my rants and raves. His wife Catherine is one cool gal too, and their toddler Thomas is one cute lil' dude. William and I go WAY back. We've been friends since we were 12 years old at Foothill Middle School. There were years where we lost touch, but through class reunions and other friends, we got back in touch. By God's grace and miracle, William became a born-again Christian in college. Since then, we've had even more to talk about. Something even cooler: William's dad and my dad were in the same civil engineering class at National Taiwan University and they were friends! Some people are just meant to be friends. I wish William and Catherine lived closer to us so we could hang out more often. You can go visit their blog, there's a link to it on my left sidebar under "Friends Who Blog". 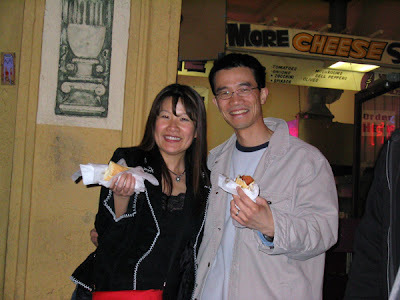 Here's a pic of me and William enjoying hot dogs from Top Dog in Berkeley, CA. Todd's band The Northstar Session played at Blake's in Berkeley last year, and William was nice enough to come out and see the band. He was excited because it was his first night out after Thomas was born. So he "lived it up" with us and had a hot dog, a beer, coffee, and saw the band. We had a fun evening chatting and hanging out. Todd on KUSI's "Inside San Diego"
Safety Pup spared from a side-swipe! Will work for carrot cake!